ICTS is aware that some wireless devices are intermittently losing connection to the wireless network (eduroam). We have escalated the issue to our vendor, and an investigation is in progress to resolve the problem. In the meantime, if you lose your connection at any time, please disconnect then reconnect your device’s WiFi to establish a working connection. We will communicate further updates as the investigation progresses. Following a generator failure, ICTS started bringing the Upper Campus data centre back online at 18h00 Tuesday evening. We expect the UCT network and all major systems to be functional by this mornin​​​​​​g (Wednesday, 20 March 2019). Updates will follow if needed regarding any services that are not fully operational. Please report any issues to the ICTS Helpdesk via email at icts-helpdesk@uct.ac.za or phone x4500. We expect the UCT network and all major systems to be functional by Wednesday morning. Updates will follow if needed regarding any services that are not fully operational. Please report any issues to the ICTS Helpdesk at x4500 or ICTS-helpdesk@uct.ac.za. Microsoft released a number of critical security updates last night to protect Windows 8, 8.1, and 10 machines from any new cyber-attacks. ICTS will release these patches via WSUS today (Friday, 15 March 2019) at 1:00 p.m. 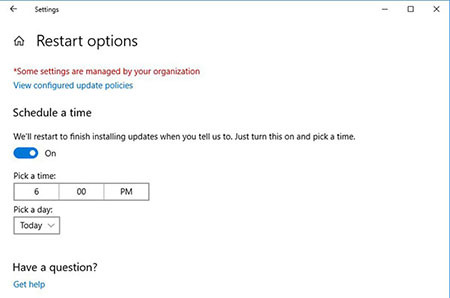 These updates will automatically be installed on staff computers who use the Windows operating system. Apple and Linux users will not be affected by this update. Once the updates are installed, your Windows computer may be forcibly restarted to apply these critical patches to the operating system. Please ensure that you save your work before 1:00 p.m., and expect that your computer may restart shortly after this time. We thank you for your patience during this important emergency maintenance. We are aware of new phishing attacks currently doing the rounds on campus. The emails – sent from UCT email accounts – refer to financial transactions – such as proof of payment, clients wanting to place more orders, invoices, and remittance advices. These emails include malicious HTML or MS Word attachments. The messages have been sent to some UCT staff and students and are attempts by criminals to access your personal information by getting you to open malicious files. DO NOT OPEN THE ATTACHMENTS IN THE EMAIL. If you did click the attachment in the email, DO NOT enter your details on the page that requests your details. Instead, please close the page and run a full antivirus scan of your machine. Then, on a device that you know to be free of malware and infection, change your password. On a device that you haven’t previously used to access the UCT network, change your password. Send an email to the IT Helpdesk informing them that your details were compromised, but that you have changed your password. Report any incidence of this to the IT Helpdesk at icts-helpdesk@uct.ac.za. You can report any other cybersecurity issues to the UCT CSIRT at csirt@uct.ac.za. All UCT machines currently running older versions of Windows 10 (e.g. versions 1607, 1703, 1709) will need to be upgraded to the tested and approved version of Windows 10. On Tuesday, 22nd January 2019, version 1803 will be released via the WSUS service. Schedule the update for a time when you will be out of the office, as it can take between 2 and 4 hours (see instructions below). We recommend scheduling the update to take place after you have left work for the day. Upgrade your edition of Windows. 1. Go to the Windows Settings panel by clicking the start button and then the gear icon. 2. Select Update and Security > Check for updates. 3. When the update is displayed, click to start the download process. 4. Once downloaded, schedule the restart for the update to run, as per the instructions below. 2. Select Update and Security > Restart options. 3. Select the time and date for your machine to restart. Once your updates have been installed and your computer restarted, you will be running version 1803 of Windows 10, with new features and benefits. ICTS engineers will be upgrading the UCT Identity Vault to a later version, which offers additional benefits and features, over the next few days. The vault links various administrative systems at UCT, and acts as a repository for user data needed for providing access to the various connected systems for staff, students and third parties making use of the UCT network. The identity vault is divided into three systems, of which each will be upgraded separately. Thursday, 10 January 2019: The authorisation system, which includes the synchronisation of passwords via Password Self-Service, will be backed up from 07:00 – 07:30. The upgrade will then commence and is scheduled to be completed by 11:00 a.m.
Should you change your password during this time, your new password may take a bit longer than normal to sync to the various systems and services. Sunday, 13 January 2019: Both the UCT login system and the identity vault will be upgraded. All services that require you to log on with your UCT username and password will be unavailable from 08:00 – 08:30 to allow ICTS engineers to back up existing information. Thereafter, both systems will be upgraded, which may result in intermittent access to some ICT services until about 15:00. You are not required to do anything during the upgrade. Should you experience any issues accessing an ICT service once these updates are completed, please log an online call with the IT Helpdesk. We thank you for your patience while we conduct this important upgrade. ICTS is currently addressing a problem affecting some IT services on campus. Our engineers have found that the problem is on the SQL cluster and are currently putting a workaround in place. ICTS is currently addressing a problem affecting access to PeopleSoft. This is due to the high number of students accessing their results on PeopleSoft via Vula. If you’re a UCT student, please access your marks by going directly to the PeopleSoft website at http://studentsonline.uct.ac.za. ICTS engineers are currently implementing a workaround to allow UCT staff to access PeopleSoft. ICTS is aware of a problem affecting the UCT Third Party System, which is currently unavailable. Our engineers are investigating the cause of the problem.